Q:Is there a matching desert plate? A:This product comes with a saucer but does not have a dessert plate option. A:These only come in the color/pattern shown in the photo. They cannot be customized. A:Unfortunately this product cannot be personalized at this time. 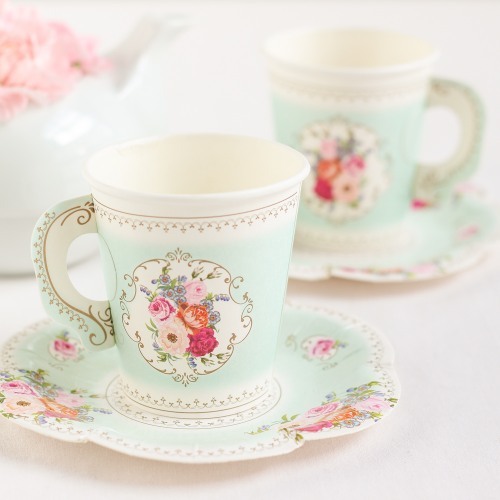 This paper tea cup and saucer set is such a fun addition for any tea party bridal shower. Each set comes with 12 scalloped saucers as well as 12 paper teacups that even include a paper handle. The teacups and saucers share a beautiful mint and pink floral design and are great for serving up cold refreshments and your favorite appetizers.